Cook broccoli as directed on bag until crisp-tender; drain. Set aside 1 1/2 cups of the broccoli. Place remaining 1 1/2 cups broccoli and all remaining pesto ingredients in food processor. Cover; process until smooth, stopping occasionally to scrape down sides with rubber spatula. In 4-quart saucepan, cook pasta as directed on package, adding reserved 1 1/2 cups broccoli and bell pepper during last 1 minute of cooking time. Drain; place in serving bowl. Add tomato and pesto; toss to coat. Sprinkle with additional cheese. 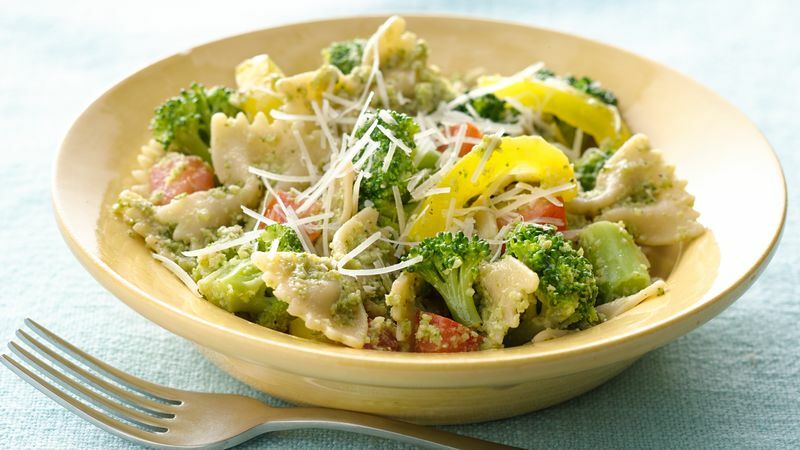 The broccoli pesto makes 1 1/4 cups. Try it in other recipes where pesto is the star! You can substitute your favorite pasta in this recipe. Just cook as directed on package, adding the broccoli and bell pepper near the end of the cooking time, and proceed as directed in the recipe.